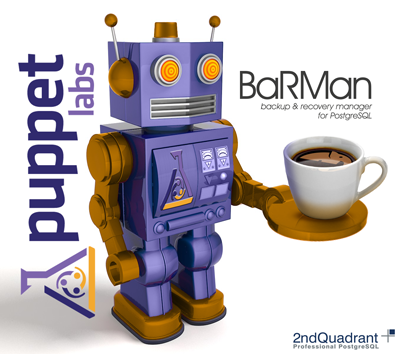 In the second part of the Automating Barman with Puppet series we configured, via Puppet, two virtual machines: a PostgreSQL server and a Barman server to back it up. However, human intervention was required to perform the SSH key exchange and most of the manifest was written to allow the servers to access each other. 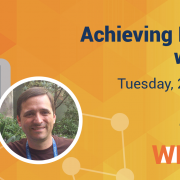 In this third and final part of the series, we will look at how to configure a third VM that will act as the Puppet Master and use it to simplify the configuration of PostgreSQL and Barman. The entire code of this tutorial is on GitHub at http://github.com/2ndquadrant-it/vagrant-puppet-barman. First, change the Vagrantfile to boot a third VM, called “puppet”, which will be our Puppet Master. To ensure that the machine is instantly accessible by the Puppet agents present on each VM, we add a “puppet” entry in the /etc/hosts file with the first script we run. We need also to enable the Puppet agent, as Debian-like distributions disable it by default. Finally, within the Vagrantfile, let’s make a distinction between master and agents. The master will initially load its configuration straight from the manifest files, then the agents running on each host will apply the configuration sent from the master. Agents will also send data back to the master allowing other nodes to use it to build their configuration. For this reason, an agent is also set to run on the master. Once we have the Vagrantfile, it’s time to go and write a Puppet manifest for the master. Two additional modules are required: puppetlabs/puppetdb and stephenrjonson/puppet. puppetlabs/puppetdb configures PuppetDB. PuppetDB uses a PostgreSQL database to collect the events and resources exported by the infrastructure nodes so they can exchange information and configure each other. stephenrjonson/puppet allows you to configure a Puppet Master with Apache and Passenger as well as the Puppet agents on the various nodes of the network. to install the new modules. Backup size: 18.7 MiB. Actual size on disk: 18.7 MiB (-0.00% deduplication ratio). Asking PostgreSQL server to finalize the backup. Although the initial configuration of a Puppet Master can be laborious, its benefits are enormous. Not only is the configuration of Barman much easier – any other addition to the infrastructure is significantly simplified. For example, adding an Icinga or Nagios server becomes much simpler when every single server is able to export the services that need to be monitored (check_postgres or barman check --nagios). Also, in the above example, we used a single PostgreSQL server and a Barman server, but in case of complex infrastructures with many database servers, it is possible to declare multiple Barman servers and use host_group to identify the Postgres servers which the Barman servers should backup. Thank you for reading the Automating Barman with Puppet series, I hope it has been useful and would love to know your thoughts. Finally, a special thank you goes to Alessandro Franceschi for the initial idea of adding an autoconfiguration system to the Barman module.